After winning this year’s Sanrio Character Ranking, adorable dog character Pompompurin is now set to appear on an undisclosed McDonald’s menu item this October! 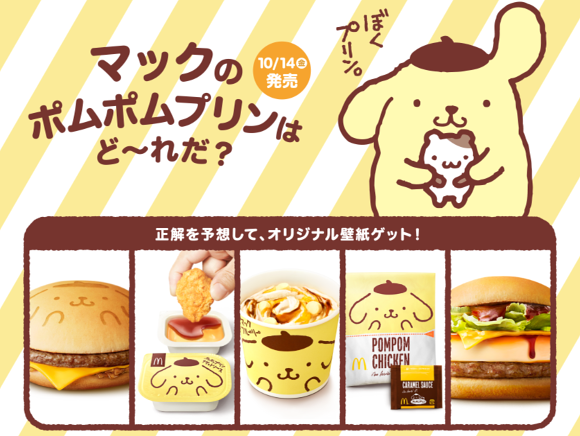 This fun activity comes as a collaboration between McDonald’s and Sanrio, and a teaser site is currently letting fans guess as to which of the 5 potential Pompompurin-themed items will appear on the menu on October 14th. The choices range from sensible to outlandish, and include items like a standard McDonald’s hamburger with Pompompurin’s visage emblazoned upon the bun and a custard McFlurry, to wacky items like crème caramel-flavored chicken nuggets and even a specialty burger featuring a caramel flan patty inside! Which item will make it to Japanese McDonalds later this month? You can check the official website, seen here, to see and vote on your choices, with the results being published on October 7th! Copyright © 2019 Tomodachi . All Rights Reserved.